These Strawberry Jalapeño Beef Polska Kielbasa Bites are a tasty appetizer that is perfect for parties! It’s sweet and savory and has a little bit of a kick. You are going to love these Strawberry Jalapeño Beef Polska Kielbasa Bites. They are kind of irresistible. I couldn’t stop popping them into my mouth. They are the perfect little party appetizer and they are so easy to make! You just throw the ingredients in your slow cooker and let it do the work. Then throw on some cute toothpicks and this appetizer is ready! I love the sweet barbecue flavor with just a hint of jalapeño. Don’t worry, they aren’t terribly hot, they really have the perfect amount of spice. 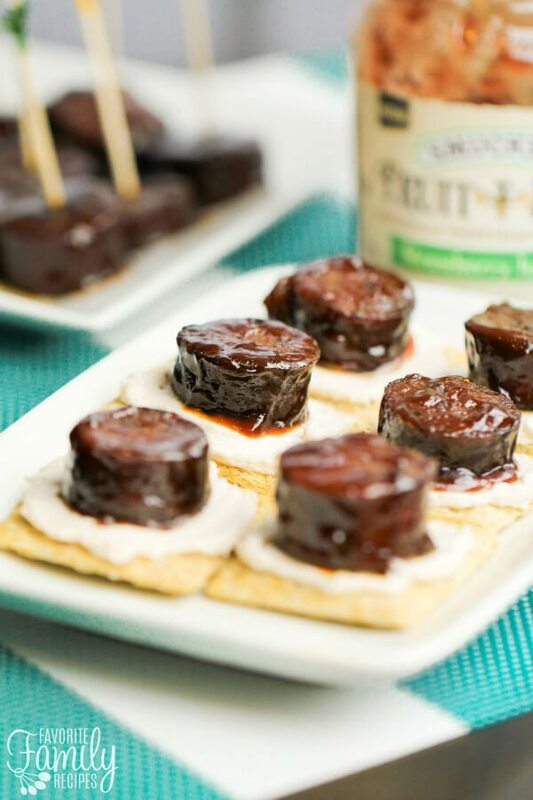 The secret ingredient to these Strawberry Jalapeño Beef Polska Kielbasa Bites is the new Smucker’s Fruit & Honey Strawberry Jalapeño Fruit Spread. I’m so excited for this new flavor from Smucker’s. It is really fun to experiment with for all kinds of recipes. Smucker’s has really done a fabulous job balancing the sweet and spice in this spread. You first taste the flavor of sweet, fresh strawberry and then the mild heat of the jalapeño comes through. It is delicious on its own, or I really liked mixing it with some cream cheese and spreading it on a cracker. You’ve got to try it for yourself! I especially like these Strawberry Jalapeño Beef Polska Kielbasa Bites over a cracker with some Strawberry Jalapeño cream cheese. The cream cheese spread is really easy to make. 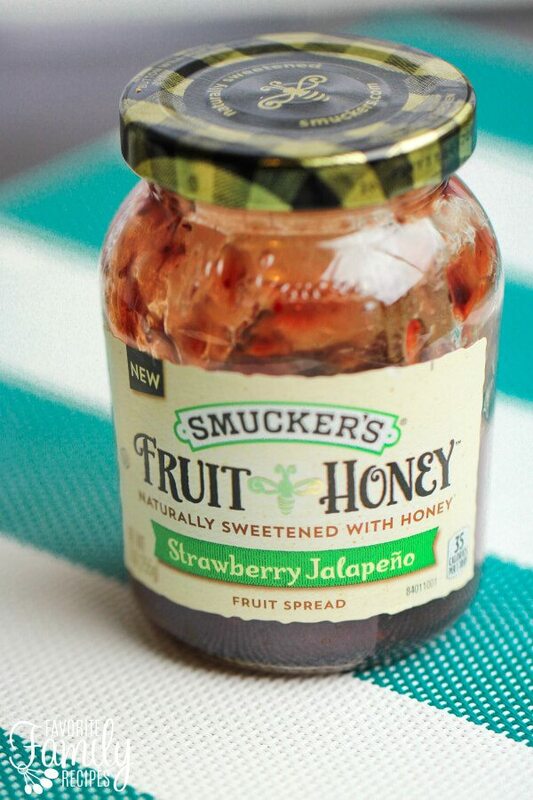 It’s just cream cheese and Smucker’s Fruit & Honey Strawberry Jalapeño Fruit Spread. That’s it! You’ll have plenty of fruit spread left from making the Kielbasa bites so all you need is some crackers and cream cheese and you are good to go. This recipe is one of our favorite Super Bowl Recipes. Be sure to check out our full list of recipes for the big game. You’ll find all kinds of saucy meats, savory appetizers, sweet treats, and delicious dips. Everything you could possibly need to host the Super Bowl (or any tailgate / sports watching party)! Find the full list HERE. 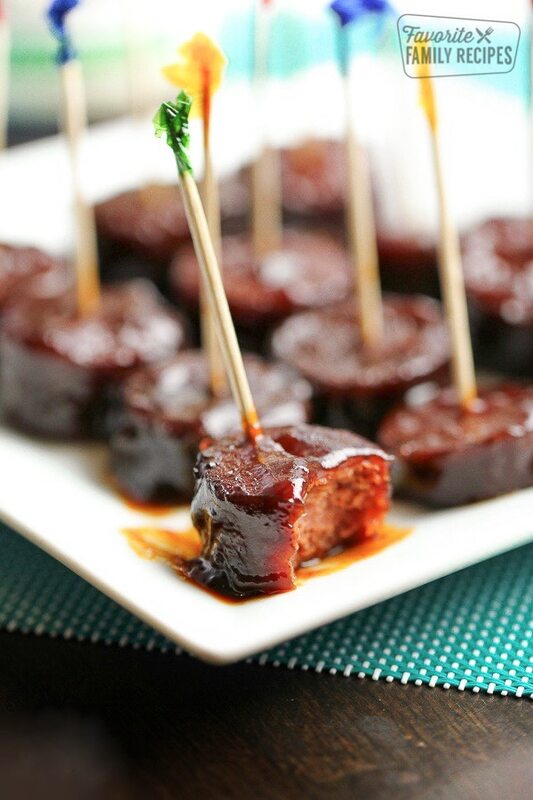 These Strawberry Jalapeño Beef Polska Kielbasa Bites are a tasty appetizer that is perfect for parties! It's sweet and savory and has a little bit of a kick. 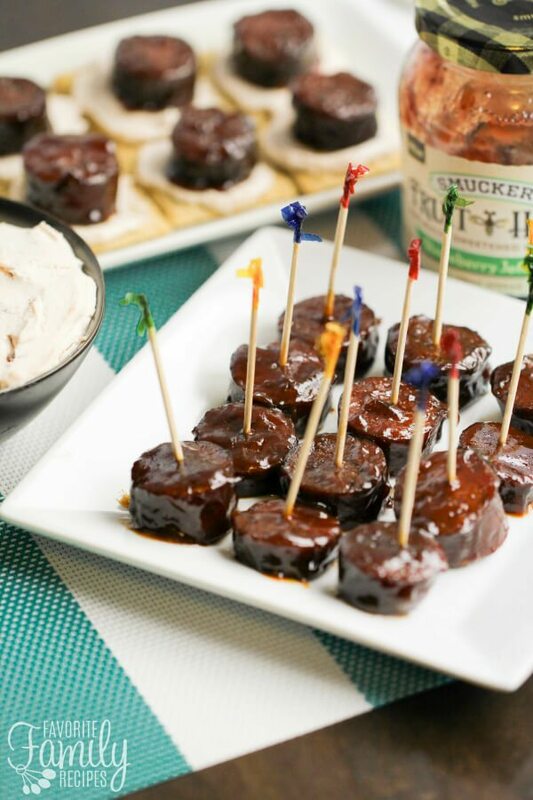 Cut the Beef Polska Kielbasa into small rounds and place in a slow cooker with the barbecue sauce and Smucker's Fruit & Honey Strawberry Jalapeño Fruit Spread. Remove from heat and serve with toothpicks or crackers and Strawberry Jalapeño Cream Cheese. In a medium sized bowl, blend together the cream cheese with the Smucker's Fruit & Honey Strawberry Jalapeño Fruit Spread until completely mixed in and smooth.